Loretta’s: For a first timer! Home » Features » Loretta’s: For a first timer! For most riders the Road to Loretta’s is difficult, nearly impossible at times, and heart breaking. This is the story for so many racers. Guys who dominate locally, but never seem to have the results at the regional level to make it into the show. Regionals are filled with pressure, full gates, and everyone is fast. Sometimes you just get bad breaks, but its tough to get that ever illusive ticket to Loretta’s. Kiefer Martin has tried for the past four years to make it to the Ranch. He’s had his ups and downs along the way. A broken leg, broken arm, concussion, and numerous mechanical problems have all been road blocks to Loretta’s. This year things were seeming to line up perfectly for him. 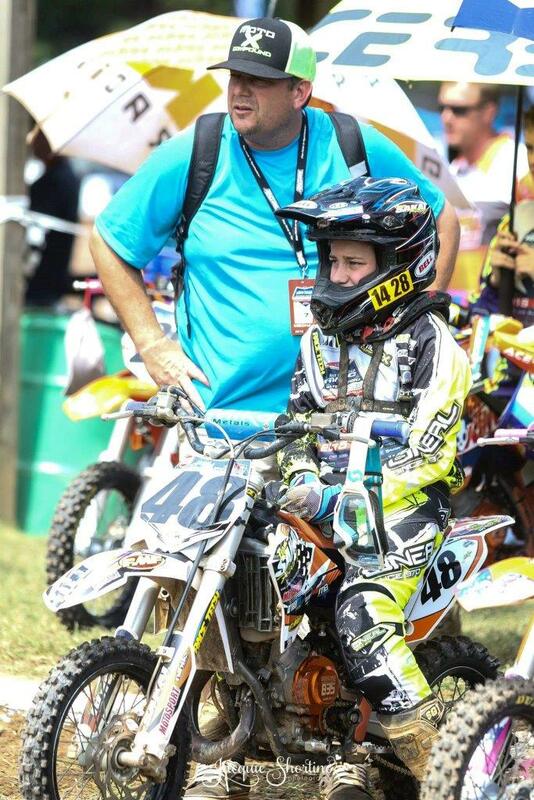 A qualifier at his home track (Vet MX Park) and the regional at Golden Pine Raceway in south Mississippi. Two tracks that he loves and knows very well. Everything was going great until he had a crash during a training session at Golden Pine just two weeks before the regional. He injured his knee pretty good and just riding his bike over the next few weeks was tough. He gutted it out and finished 9th at Golden Pines. His lap times were way off what he had been running, but several guys that qualified ahead of him had gotten in on 85’s so we knew he had a decent chance of making it. After the official roster was released Kiefer found himself in the first alternate position. Just one spot out, but he definitely had a good chance of getting in. He was definitely going to get to practice and have a fun week at Loretta’s regardless of whether or not he made it in. Kiefer got registered and got his practice stickers on Sunday, but was told it may be late on Monday before he would know anything about racing. Practice was tough. A lot of the kids had been there, they had knew the track, they had already felt the tremendous amount of pressure that racing at Loretta’s brings. Kiefer did his best to learn the track during practice. 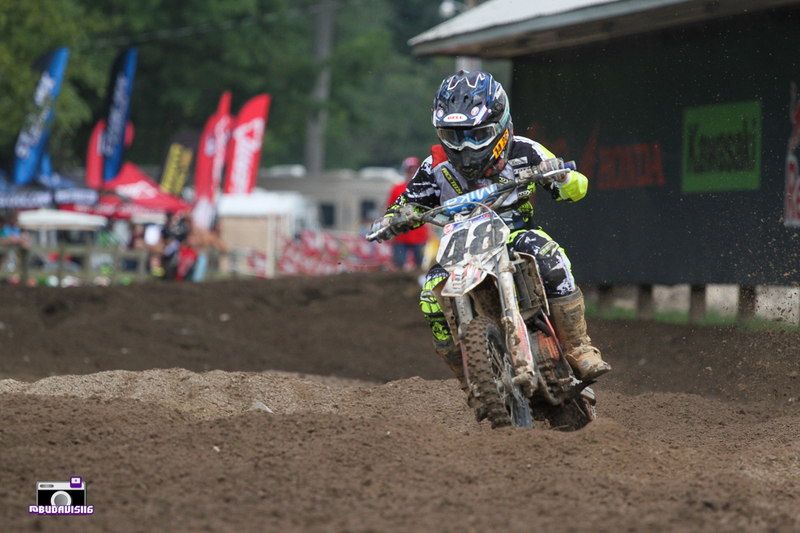 Luckily he wound up also being a top 5 alternate in the 65cc 7-11 class as well so he got a second practice. The track was covered in sand for practice so we were running a sand tire, actually the same tire we ran at Golden Pine. Kiefer wasn’t feeling confident about anything at this point. He came off the track from the 7-11 practice and found out that he was in, his name was on the board to report to MX Sports for his bib. He really couldn’t believe it. Getting a bib and a ticket to Loretta’s! We rode to the MX Sports trailer and reported in. Kiefer was given about 10 choices of numbers to pick from based on the size bibs they had left and numbers that weren’t being used in the 65cc 10-11 class. He picked #48. They gave him his bib and a ticket to Loretta’s. It was probably one of the most special things I have ever witnessed. We went to the gate for moto 1 Tuesday morning at 11:30am. I don’t think I have ever felt so nervous or anxious in my life. I kept thinking if I feel this way what must it be like for Kiefer. He drew the 19th gate pick, which isn’t that bad. He picked a gate right between Max Vohland and Mark Stone, Jr. We went to the gate with same setup we ran in practice. There was a guy from Dunlop there checking to see what tire everyone was running. He couldn’t believe we were running the sand tire. Man did this make me feel good, there was no way we could change it now. Then I talk to one of the guys from KTM and he couldn’t believe it either. He said he bet we would be 20 seconds faster with a MX32 (made me wonder if we should have run a MX32 at Golden Pine as well). I didn’t say anything to Kiefer, he didn’t need the added stress. So the gate dropped, Kiefer did the best he could but went down several times in the first moto. Needless to say the tire wasn’t working at all, the track had changed a lot from Monday. Kiefer finished 38th. I don’t think I have ever seen him so mentally and physically drained. The heat, the track, the competition had really hit him hard in this moto. Moto 2 was Wednesday at 5:30 pm. We had gone back to the MX32, Kiefer felt good and was hydrated to the max. He wound up getting the 4th gate from the inside which wasn’t to bad for the 38th pick. His start was decent, just inside the top thirty. He was 27th at the end of the first lap, and passed a couple of kids over the tunnel jump for 25th. He went in the behind the billboard and washed out. He fell back to last place and was only able to get up to 38th. His lap times were really good until the leaders caught up, then he obeyed the blue flags and stayed out of the way. By the way, the Dunlop and KTM guys were right, he picked up about 20 seconds a lap with the MX32 over the Goldentyre. I guess the 65’s just don’t have the power to pull those type tires. Moto 3 was Friday at 2:30 pm. Kiefer was more determined than ever. He knew he could run in the top 25, and really wanted a good finish in this last moto. He didn’t get a good start and was next to last at the holeshot, but worked his way up to 34th by the end of lap one. He passed 5 more riders on lap two and was in 29th. On the third lap we was railing the outside of turn 2 and went down. He was in 26th and fell back to 36th or 37th. He got back around a few kids pretty quickly but had lost the big pack in front of him. He worked his way back up to 33rd and at the end of lap 7 the leaders caught him. Unknowingly he let one kid get by him on the last lap because of the all the blue flags and he finished 34th. Not the way he wanted to go out, but still his best overall moto. He ran a good pace, and if he would have stayed up on lap 3 it would have been a great finish for him. In the end this was an experience that we will never forget. He had so much support from friends, family, and teammates. I got so many text messages (when I would go into town), it was amazing. Was it worth, you better believe it. It was great experience for our whole family. I think MX Sports does a great job with this event, and hope we get back next year.